America's Breeders' Cup is back this weekend, offering bettors a challenge: placing winning bets on 13 Grade One races on both turf and dirt. 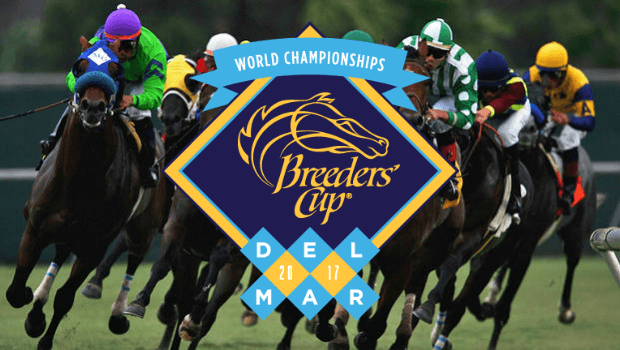 With $28 million in prize money guaranteeing ultra-competitive racing, this year's Breeders' Cup also features the added conundrum of being held at Del Mar for the first time. One thing's for sure, though, betting on these races is exhilarating, challenging and potentially rewarding if you're able to locate the strongest market leaders, or hit some of the big-priced winners the event so often features. Read on to find all the expert picks for bets worth backing at The Breeder's Cup 2017! Last year's Breeders' Cup was a tricky affair for punters, with only one favourite crossing the line from 13 races – a strike rate of 7.6%. The obvious question is whether this year's races, held on Friday 3 and Saturday 4 November 2017, will favour online bookies or punters backing the fancied horses. Rather than dwell on last year's antics, it may pay to look for races that very frequently and historically favour the top of the market horses. Most strikingly, this includes the Distaff on Friday and two races on Saturday – the Mile and the Sprint – with three horses appealing as singles and a 40/1 treble. The classiest race on day one of the Breeders' Cup festival is the Longines Distaff – a 9 furlong dirt race with strong credentials for favourite backers (nine races, five winning favourites). Stellar Wind and Forever Unbridled head the online betting at 7/4 and 10/3 respectively according to bet365's bookmakers. But trend followers will want to give serious consideration to the third in line, Elate, trained by Bill Mott and backable at 7/2 with bet365. The trainer has won the Breeders' Cup Distaff five times and the horse is likely to have been aimed at the race all season. Reports have been positive following a recent workout. The Mile is set be a thrilling race. Billed as the 2/1 American favourite, World Approval will be versus the British challenger and second favourite Ribchester at 7/2 with online bookies. Historically, five favourites have won across nine runnings of the race and the American-based jolly is held in high regard by connections. Ribchester, available at 7/2 with bet365, is a huge threat, however, and a fascinating runner who's running his last ever race before retiring to stud. The British charge is likely to set a strong pace given his exuberant style and that's potentially the best tactic to drawing the sting out of any stamina doubts with the rest of the field. Indeed, while connections suggest he wants a decent pace, his stamina limitations have been exposed. The fact that connections have decided to send Ribchester to the Breeders' Cup in search of the fast ground to utilise his electric pace following several weeks of speculation looks a hint to punters to support the UK raider. Favourites have a record of 50% in the Turf Sprint and market leader, Lady Aurelia, is one of the most talked up five furlong sprinters of 2017. Having destroyed the field at Royal Ascot in the King's Stand Stakes, the three-year-old filly has been shooting for the Breeders' Cup all season, making her odds of evens with bet365 justified. Theoretically she has to reverse form with British raider, Marsha, who beat the filly in York's Nunthorpe Stakes in August. But Marsha's ability to handle the tight bends she faces this weekend are questionable, according to her trainer Sir Mark Prescott. In contrast, Lady Aurelia thrilled clock watchers, which left her trainer ultra confident. The $6 million Breeders' Cup Classic isn't just the final and biggest race of the meeting, it's also being publicised as the decider to win the prestigious 'Horse of the Year' award, which is always coveted by almost all trainers. Of course, for this to happen, one of the three main protagonists in the betting will need to win. Namely, the 15/8 favourite Gun Runner, last year's winner and second favourite Arrogate, or his stablemate and third in the betting, West Coast, at 11/2 with bet365. One key trend for the race is the record of hall of fame trainer Bob Baffert, who already holds the record for three consecutive victories. Given that the horses Baffert has won the race with have all been improving, three-year-old West Coast fits the bill and makes for strong each way appeal at 11/2 with bet365 to take the Classic. This year's Breeders' Cup features a record number of British racers heading to the US to lay claim to glory. While searching for elusive big money winners can pay dividends, Lady Aurelia at evens looks the horse to back when it comes to placing a Breeders' Cup banker with the bookies. Whether you're looking to lay some wagers the day of or think you have your winners now, visit Bet365 for all the latest odds!